Located in Nha Trang, a sea side city of Vietnam?s south east coast, this vacation villa has a very privileged location. Carved into the hill, the site of 500 sqm enjoys a unique ocean view, overlooking the bay and mountains in the background. The goal was to find solutions at early stage of the conception to optimize this viewing experience and manage the high constructions density of this residential area in the future. The overall design put the accent on the simplicity of the construction shapes, the use of raw and natural materials and some innovative interior functions. Also, the contrast between the brutalist influences of the main construction and the interiors carefully crafted is intense. The visitors experience, when coming inside, is real. The property is accessible from the back street, on the upper part of the site. 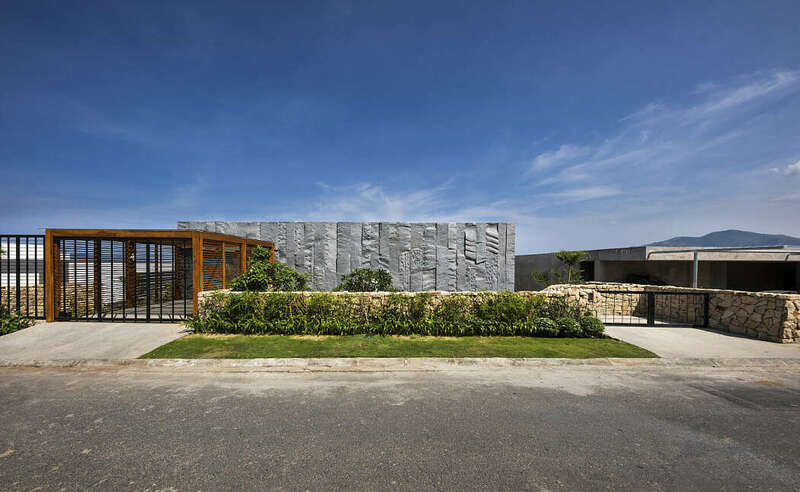 Consisting of a wall of coarsely carved sculptural stones, in reference to the very rocky immediate environment, the facade on the street is completely opaque. It ensures privacy and orients radically the villa towards the sea. The sets of shadows and lights on the granite blocks array add drama effect and create a strong impression at the arrival from the street, day and night.